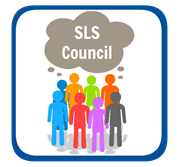 Council Members may also serve on standing or ad hoc committees to assist in the planning, advising and organizing of council priorities and initiatives. Communication Coordinators provide two-way communication between member libraries and the School Library System. The Council meets in-person four times a year; Communication Coordinator meetings immediately follow Council meetings.